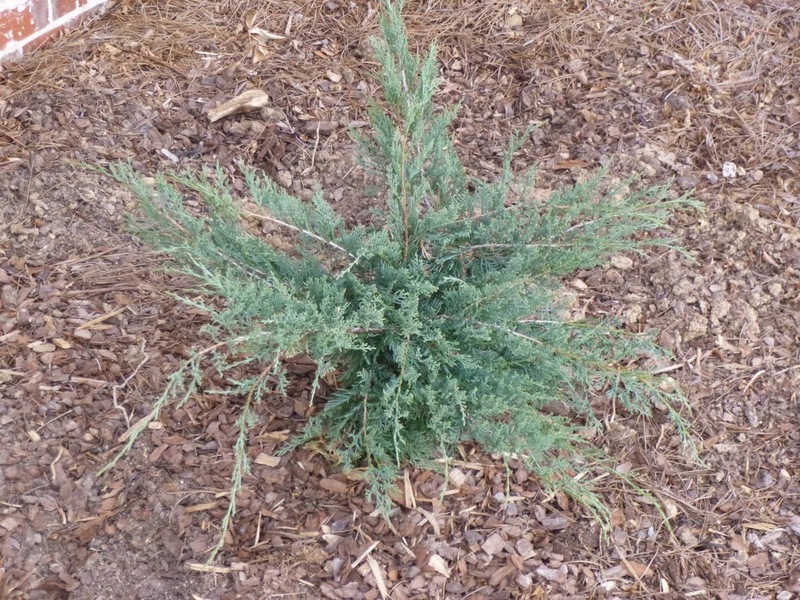 Garden of Aaron: And They're Back! 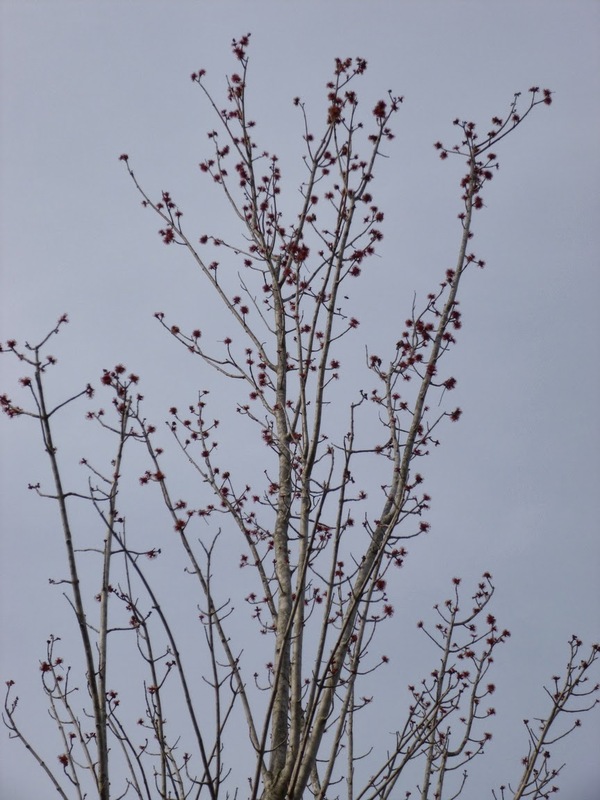 If you’re anything like me, you start looking forward to spring around, oh, January 2nd. 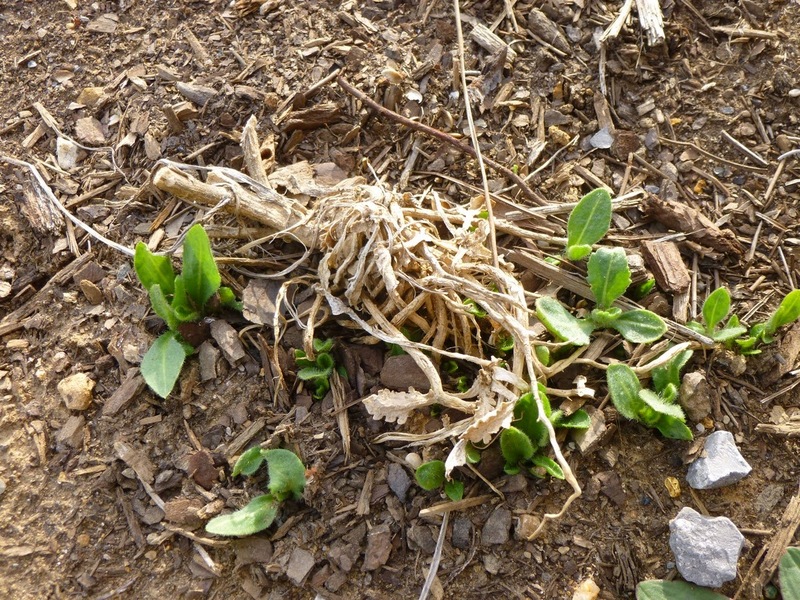 But it’s a long, cold slog from the dawn of the New Year until many plants starting showing signs of life here on the zone 6-7 border in Middle Tennessee. 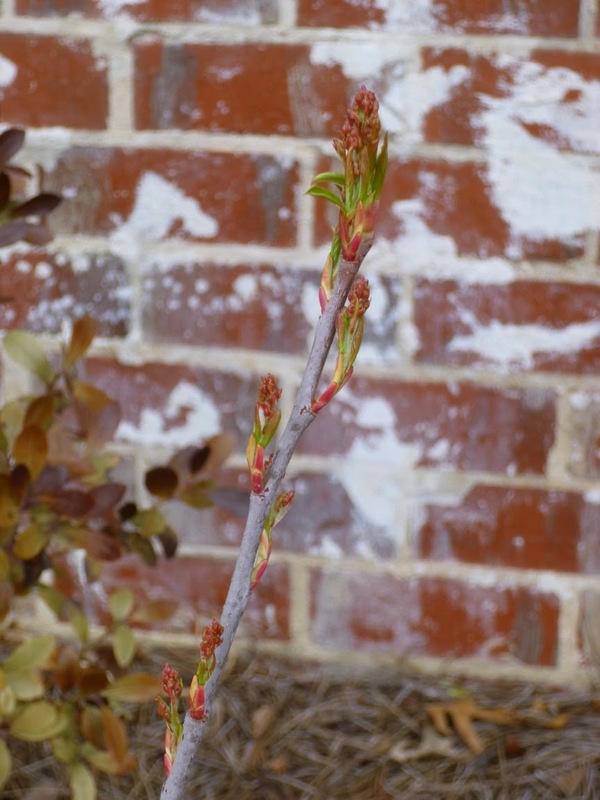 Trees like Crape Myrtle and Vitex may be able to handle our summer heat, but they can take until mid-April to start leafing out. 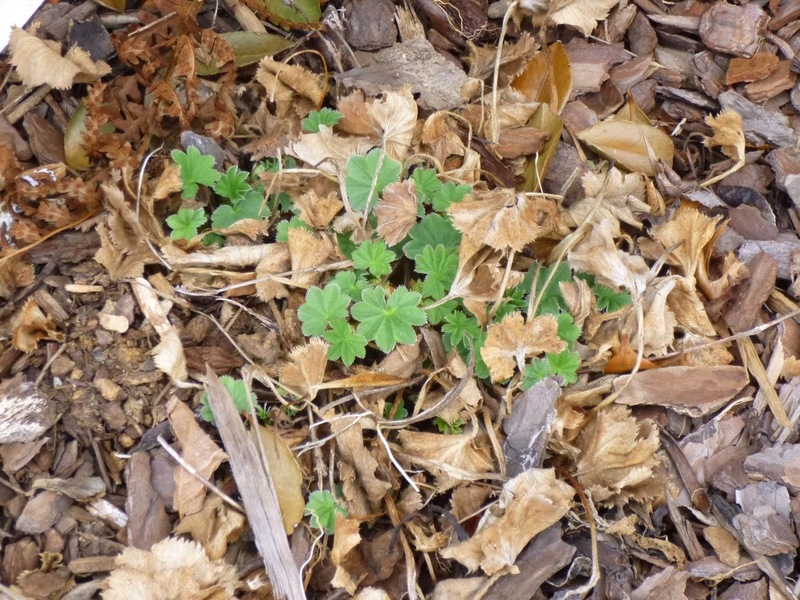 And perennials like Hardy Hibiscus can hide below ground until at least that time. 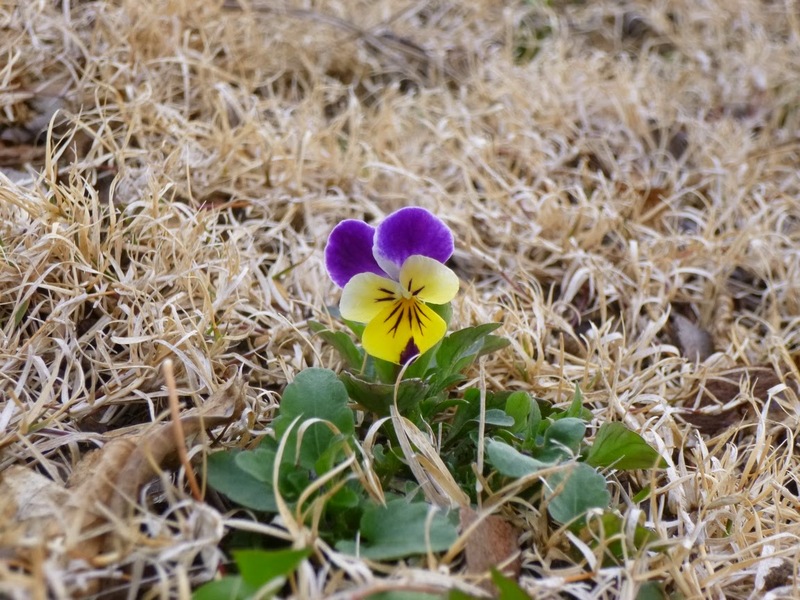 Since this winter was particularly harsh, I was worried that Spring would come late. 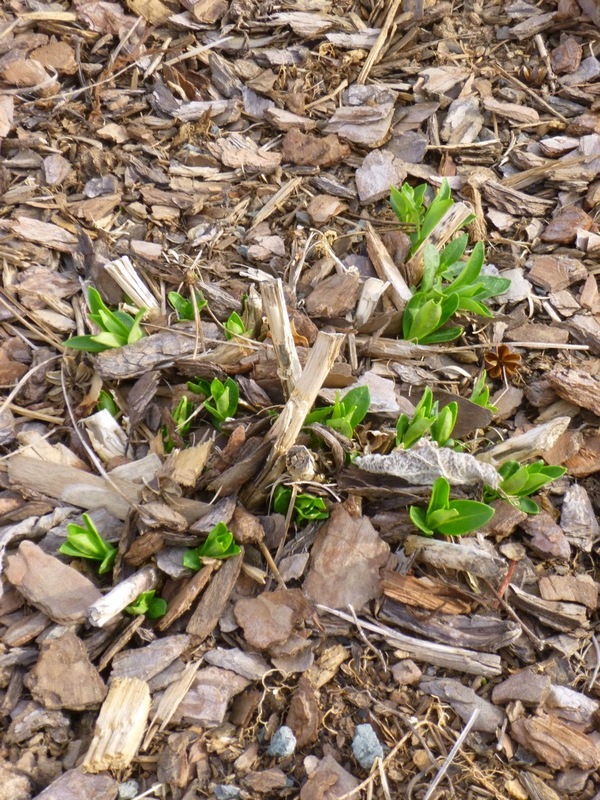 But a stretch of temperatures in the 50s and 60s has breathed new life into the garden. These plants sat in the garage all winter with barely any water. 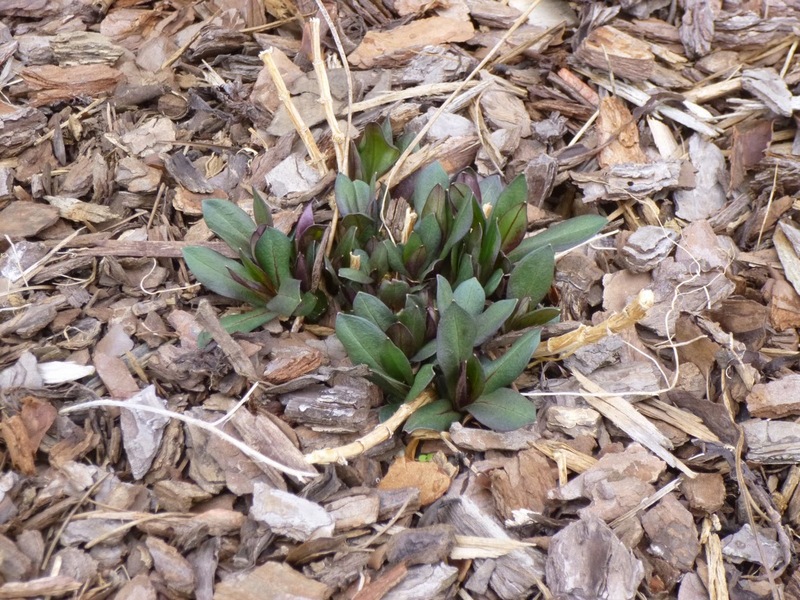 I bought them too late last year (via mail order) and the weather turned brutal before I could get them in the ground. And yet, they survived. Color me impressed. 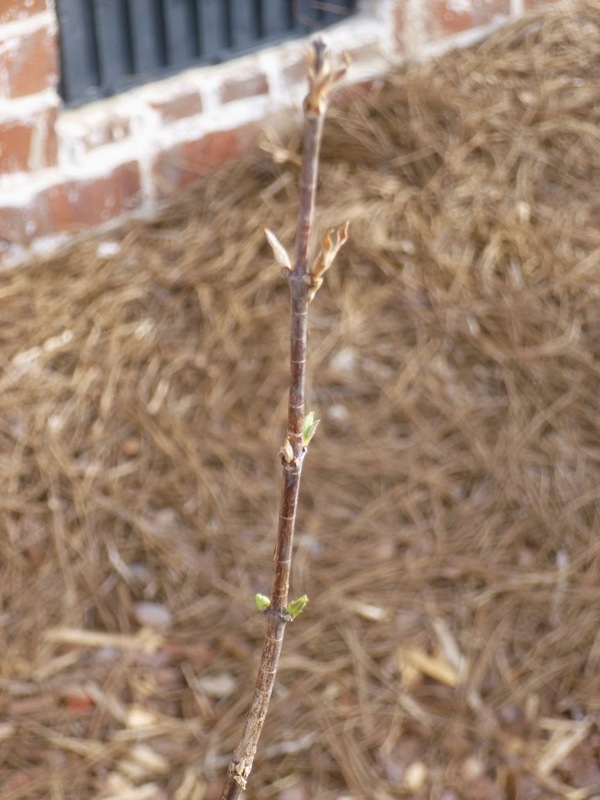 New leaves on Alleghany Viburnum. 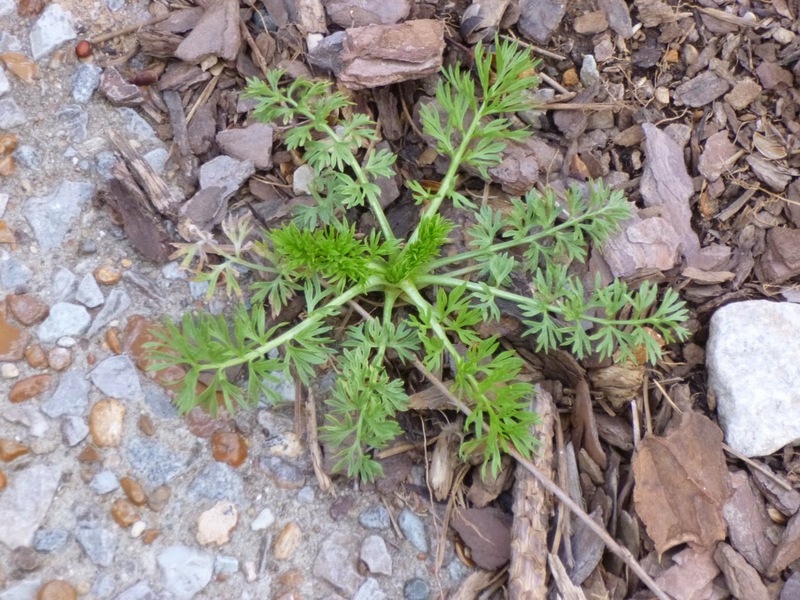 Actually, the leaves have looked this way for weeks now. It's my first spring with this plant, so I'm not sure if this is normal or when they'll unfurl. 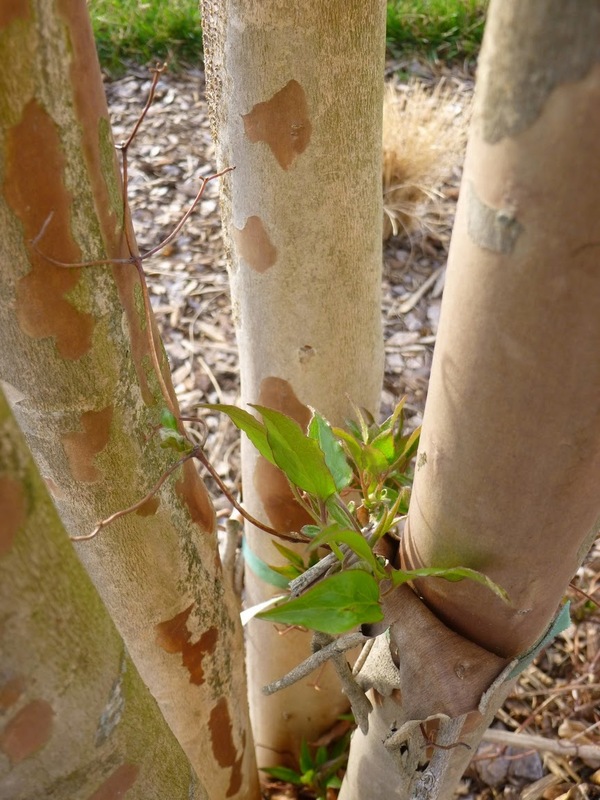 I do like that P. paniculata emerges so early and the young leaves look beautiful. They tend to look tired and tattered later in the summer in Middle TN. 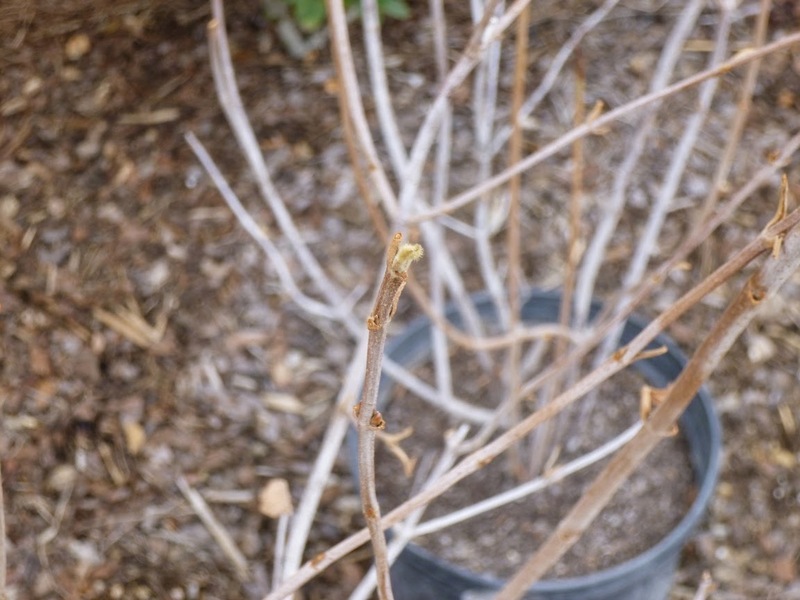 I may try thinning out the stems this year to see if that helps improve air circulation and prevent mildew. Mock Orange, Philadelphus x virginalis "Natchez"
Hydrangea quercifolia, Oakleaf Hydrangea "Snowflake"
If you grow Love in a Mist, be aware that it can self sow enthusiastically unless seed heads are removed. 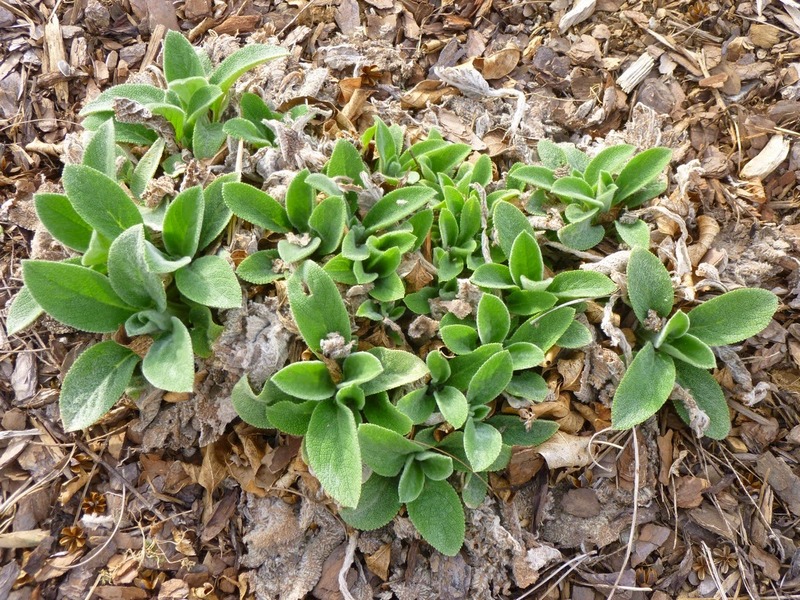 Stachys byzantina, Lamb's Ear "Helene von Stein"
Note that I left last year's dead leaves to decay. 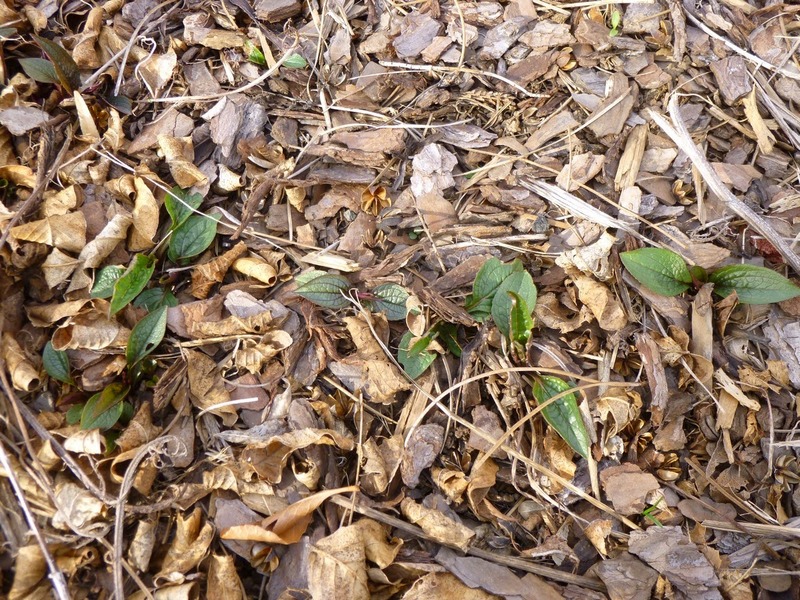 Most sources advise raking the dead leaves away in the spring, but I wanted to see what would happen if I left them. 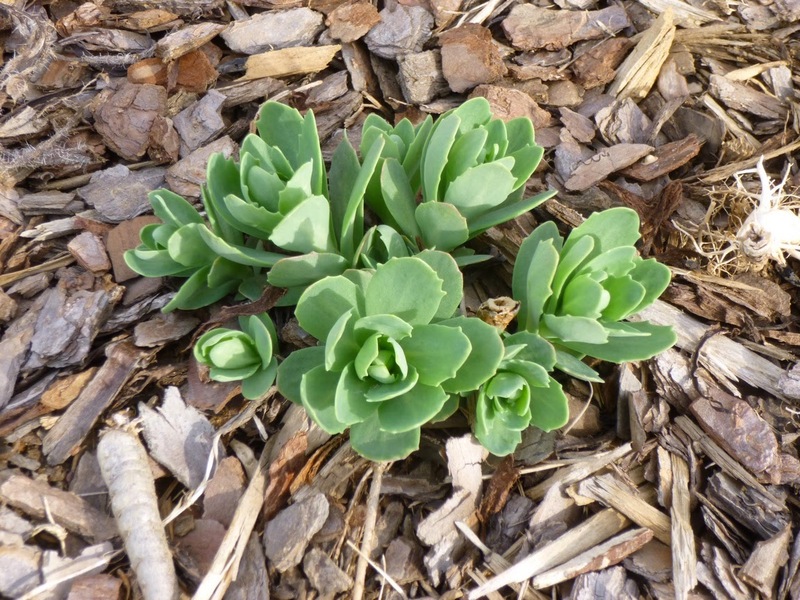 So far, the Lamb's Ear seems to be doing just fine. 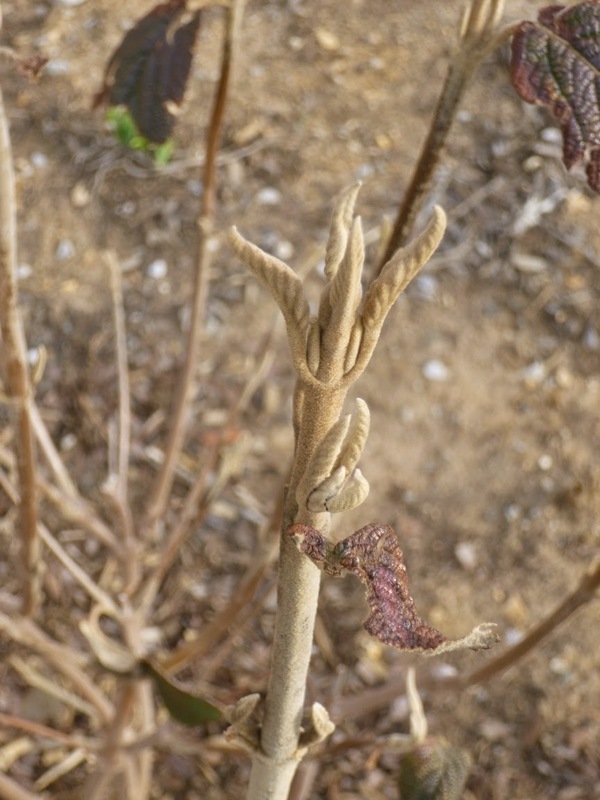 I hope the old leaves will decay in warm weather and provide the plant with nutrients. 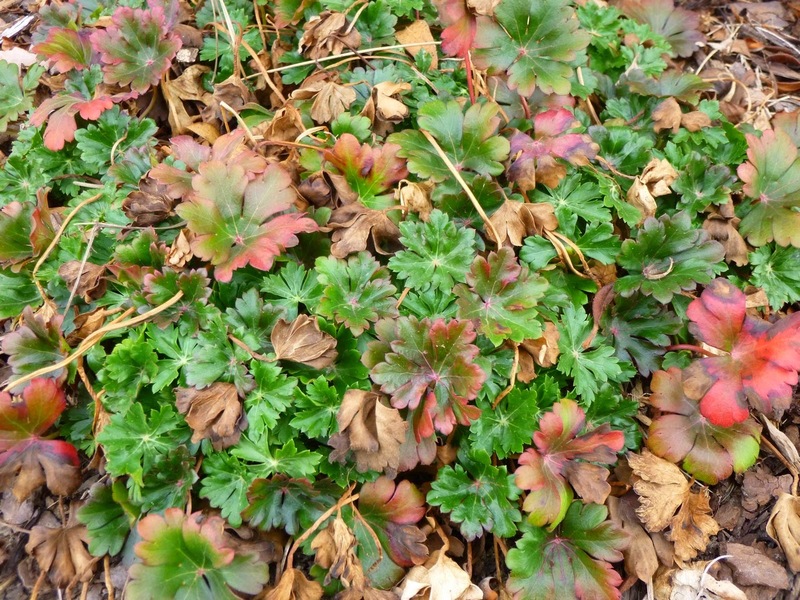 It's a little unsightly at the moment, but I presume the new leaves will soon cover the old foliage. 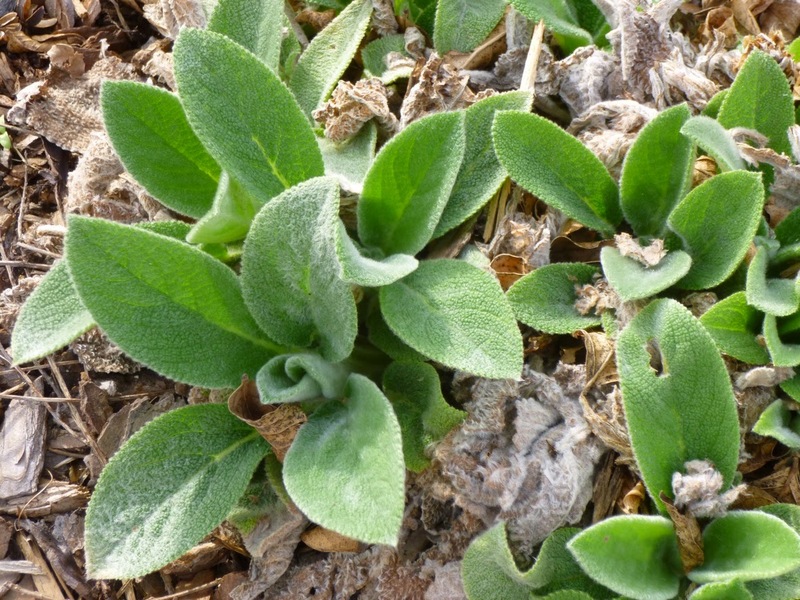 Close up on the Lamb's Ear. Geranium x Cantabrigiense, Cambridge Geranium "Biokovo"
I had lots of these last year, but this is the only flower I've seen so far this year. Hopefully more will soon appear. 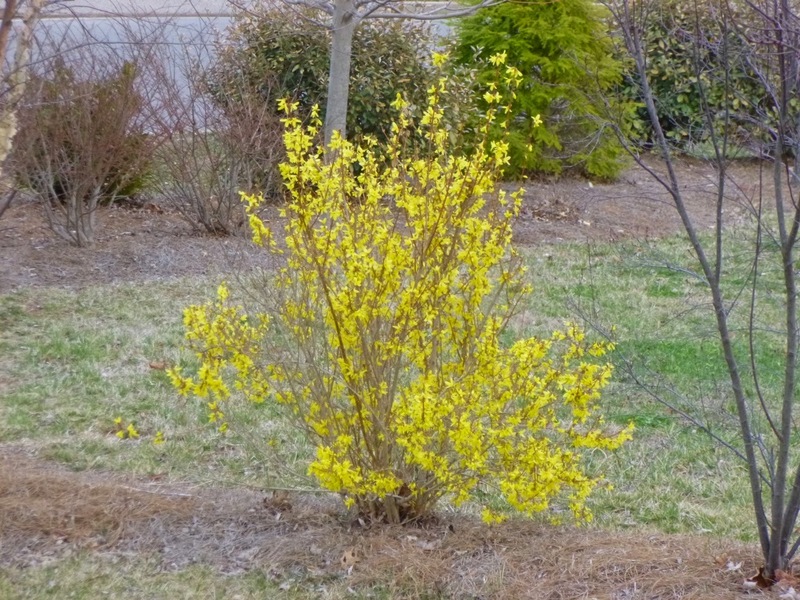 My neighbor's forsythia. All the forsythias in the neighborhood have burst into bloom in the past few days. 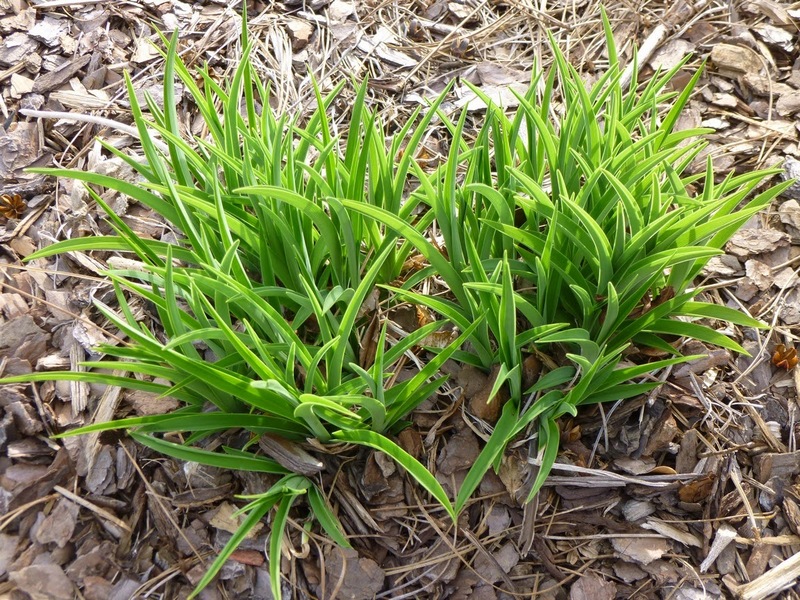 As I've mentioned in other blog posts, I'm not a huge fan of daylilies for most of the year. 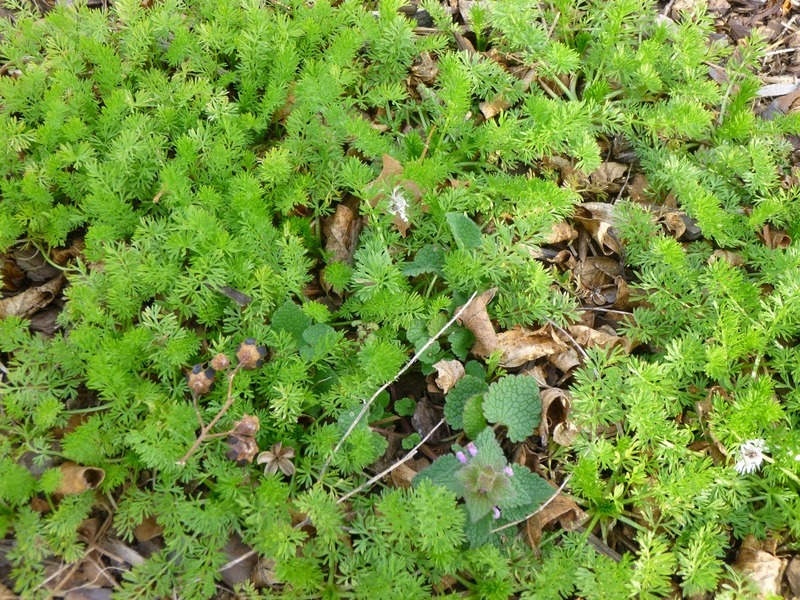 But I do love the exuberant fresh green foliage in early springtime! I'm trying to train this clematis to climb a crape myrtle, so far with limited success. I leave the seedheads standing over the winter both to feed the birds and to help the Coneflowers multiply. This strategy seems to be working! 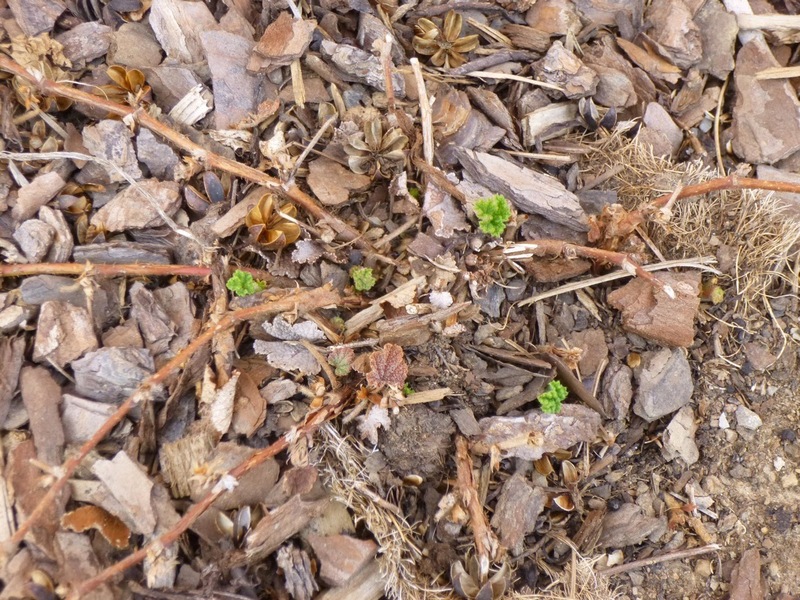 I was under the impression that Creeping Raspberry was an evergreen groundcover, instead it seems to be performing like an herbaceous perennial in my zone 6/7 garden. But I'll be patient. 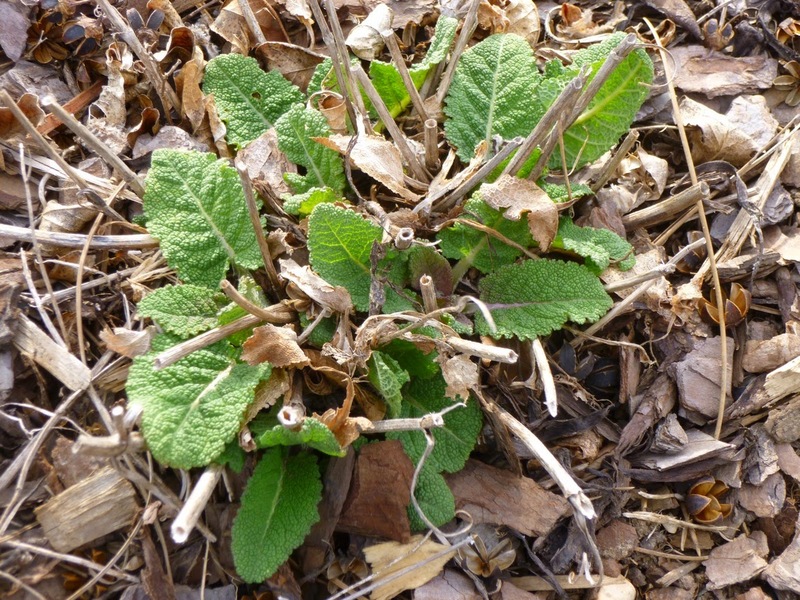 Perhaps the old stems will sprout new leaves later in the spring? Anyway, it's nice to see new growth and know the plant is not dead! 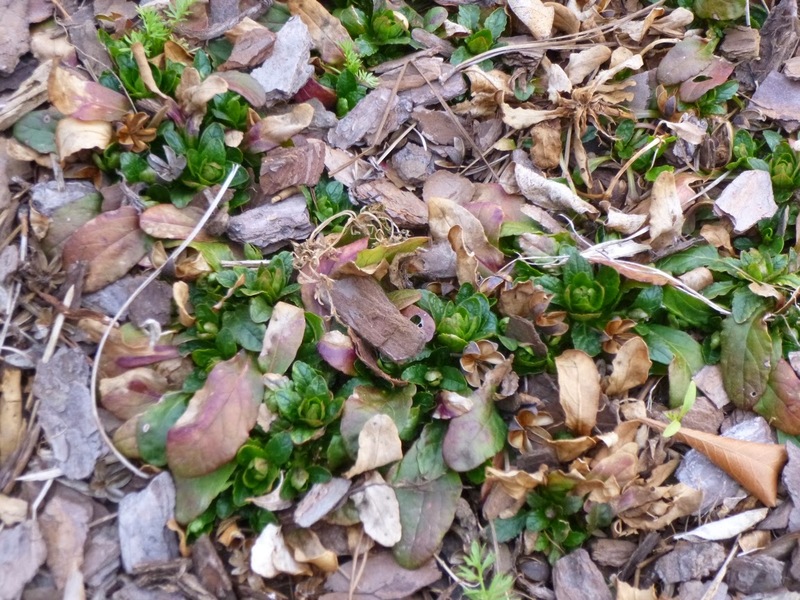 Several young camellias were severely damaged by our cold winter. 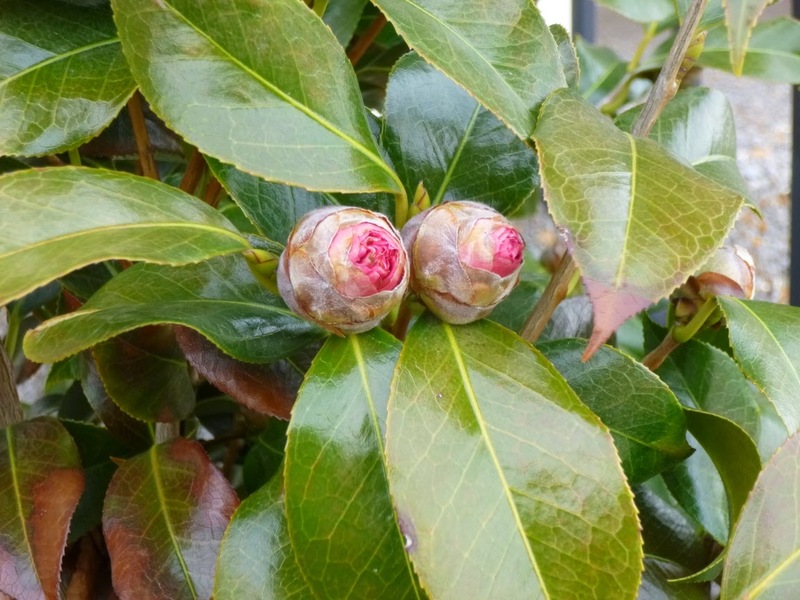 You can see that this established camellia suffered some foliage damage too. 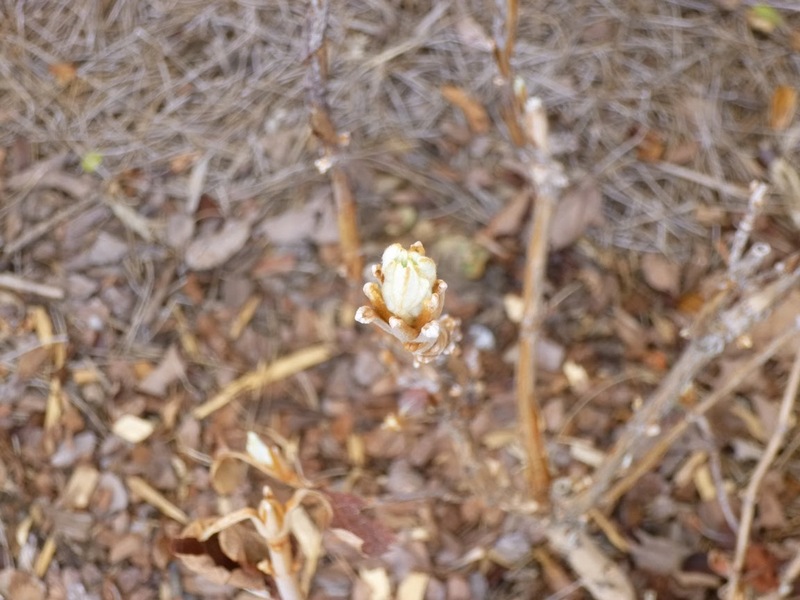 Still, I'm impressed it did not drop its buds. 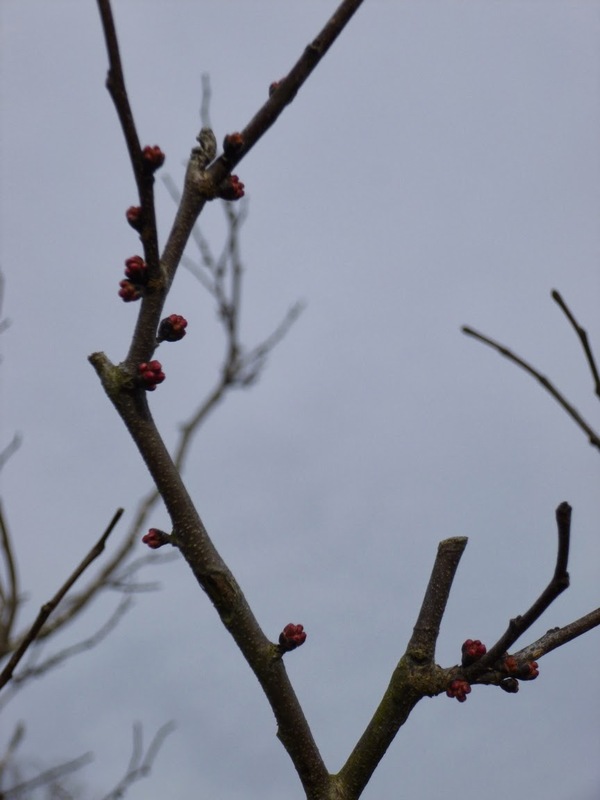 They seem poised to bloom any day now. 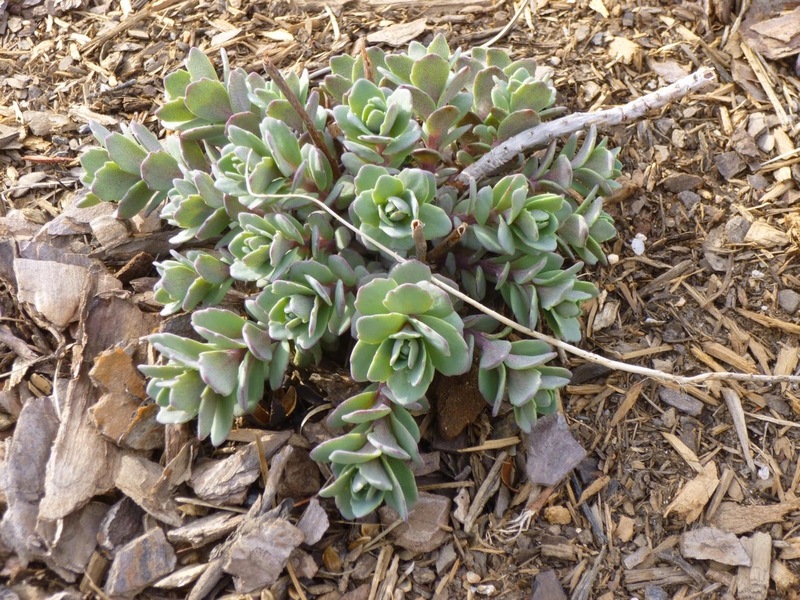 As with the Lamb's Ears, I'm experimenting with leaving the old foliage in the hopes it will decay and fertilize the plant. 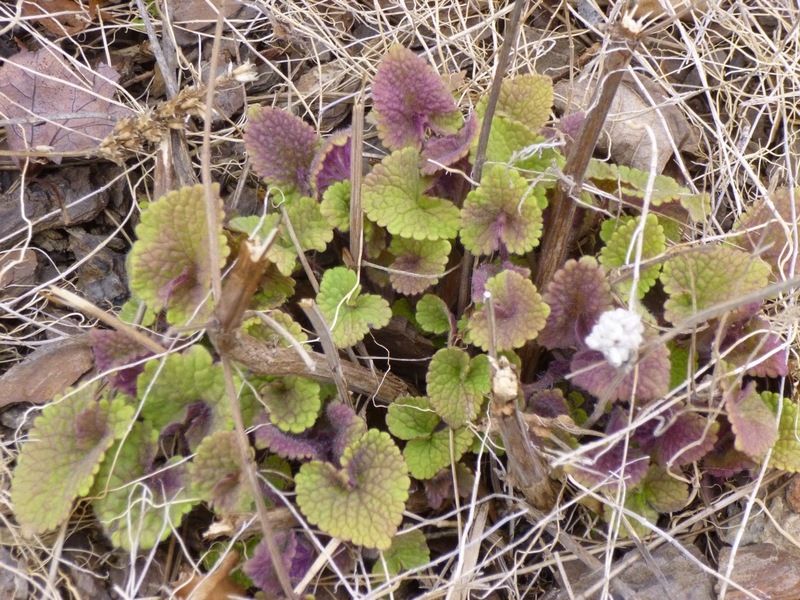 Agastache foeniculum, Anise Hyssop "Golden Jubilee"
Love the coloration on these early leaves. Later, they'll turn bright gold. 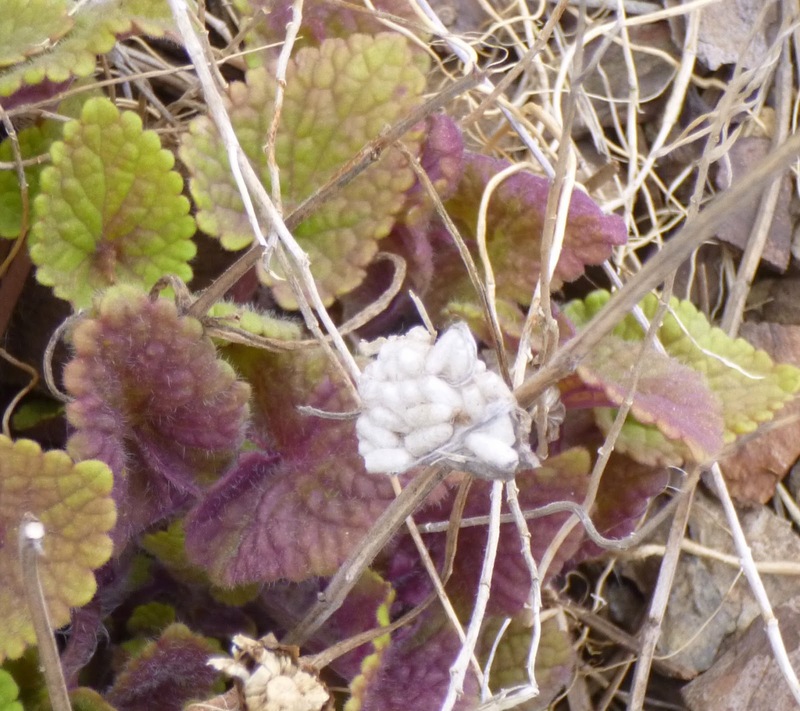 Close up on a bunch of tightly-packed cocoons on the old stems of the Golden Jubilee Agastache. I've no idea what species spun these cocoons, but perhaps I'll get to see if/when they hatch! 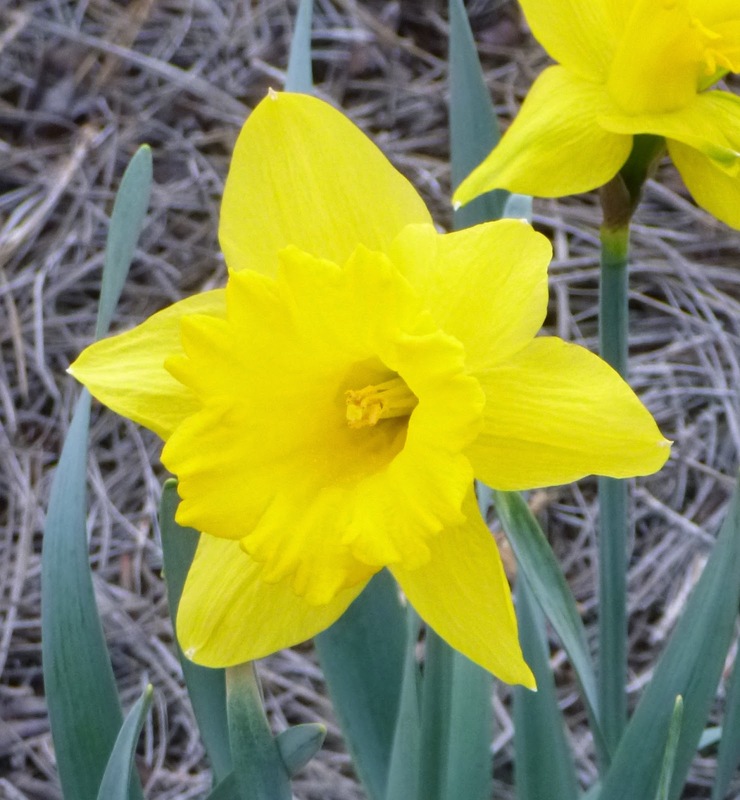 So...how’s spring shaping up in your garden?